Embezzlement is different from ordinary stealing. An embezzler, by definition, is someone you trust, such as an office manager or a valued employee. A 2007 study by the ADA found 17.5% of the surveyed dentists reported that they were aware their primary practices had been embezzled. Maintain Separation of Duties Don’t concentrate too much control over cash into the hands of one person, such as using only one team member to issue checks, record deposits and reconcile the bank statements. Instead, divide these tasks among multiple employees, or between the employee and yourself to create a cross-check where unusual activity is more likely to be noticed. Use Random Monitoring Let your team notice that you are keeping an eye on the details. Monitor some reports every day, including every patient visit, every payment, and every EOB. Other checks, such as payroll and inventory, should happen randomly, without prior notice. It’s easier to “beat the system” if the embezzler knows that as long as everything looks good by the end of the month, no one will be the wiser. Keep Valuable Documents and Materials Locked Up Reduce temptation — keep blank checks, payment receipts, prescription pads, and accounting records out-of-sight and locked up. Consider securing valuable supplies, such as whitening materials or toner cartridges, which can be easily re-sold outside the practice. In addition to tactics that may help prevent embezzlement, the publication also addresses the actions you should take if you believe you may have been a victim. 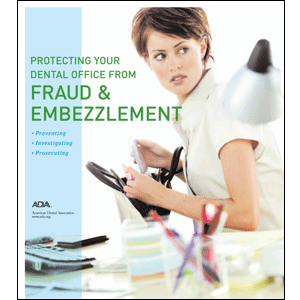 From working with attorneys to termination issues unique to suspected employees, Protecting Your Dental Office from Fraud and Embezzlement addresses a plan of action that can mitigate losses and minimize hassles. Great article and a real eye opener. I feel as long as you have a great relationship with the office manager and you make it a point to sit down and look over everything once a week I don’t feel that you will ever have a problem with embezzlement. This is your Dental Office you have to be involved in your office not just the patients. When you hire employee you never think that they are going to embezzle your company, but unfortunate it does happen. You just have to keep on top of what is going on in the day to day business.